Last April, Stereo Assault hosted its first big showcase in St. Louis featuring Gee Watts, M.M.E, Souls of Liberty, and others. It was a great event with our best attendance turnout of any of our other shows. However there are 10 things I wish I knew before promoting my first show and I figured they could benefit others. So you have a dream to throw the perfect show, party, concert, or event? It’s all a dream first, but the goal is how do you make your dream become reality. If your dream show has a purpose with goals, then you have a better chance at throwing a successful event. Each show we do has purpose, a vision, and a dream. If there is no purpose what will give potential attendees an incentive to come, they won’t. Our first show’s purpose was to curate and highlight some of the top St. Louis Hip-Hop performers and our longterm goal was to develop an interconnected community of music fans and artists. I came to this solution of our goals and purpose after the event happened, but I never defined them before the show and that is what makes it key. I made this well known in my previous post, but understanding how it works helps from the start. 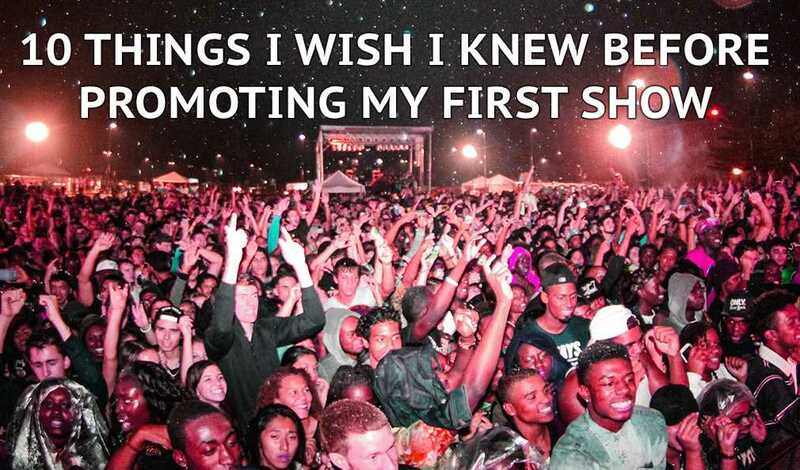 Most clubs and bars have insurance coverage so the promoter doesn’t have to get it. The reason I had to get insurance coverage for my first show was because I was attempting to host a concert on a college campus and it was university policy to have your own liability insurance coverage. Knowing whether if you will need it or not and grabbing coverage rates if needed will be one of the first things I do, always. Sponsors are hard to come by. I thought it would be easy to attain a few sponsors to help offset costs, provide exposure to those brands, and build a connection with our attendees. Pitch after pitch after pitch, I realized, if it’s something they can do themselves, why would they sponsor. I found out too late I had to be more creative in our sponsorship packages and benefits if we wanted to accomplish our sponsorship goals. Have you ever thought about how the wrong vibe can lead to a less memorable event? It is key with event management and preparation. If a venue’s vibe doesn’t match the vibe of the event, the artist’s performance may not to be as memorable. After long deliberation, the decision was made to move the event from a college campus to a local music venue. Well before you even announce the show, having a defined and established promotion strategy should be planned. Having a general idea of how you want to promote a show is okay, but that’s what made my first show event’s turnout just good rather than great. Establish a day to day promotion strategy and execute it with precision. Social media, flyers, the whole nine yards. This means don’t expect a high number of attendees because it’s a dope lineup. Work towards the high number, don’t expect it. You know if you do X, Y, and Z, you can get this amount of people possibly through the door, but never expect more. But because you don’t expect it should never stop you from working hard to have more. We knew once we moved to the smaller venue, we could draw 60% of the venue capacity off the basic promotion work and artists fan-base, but if we worked harder we could’ve done 80%. Guess low, but aim high. If you have the right team, the event will go so much smoother. If the graphic designer designs an attractable flyer, people will be drawn to it. If the street team does what they are supposed to do, you will have a great turn out. If the day of show team provide excellent customer service, the event will operate smooth. Having clear communication and a team committed to excellence, makes the show amazing. I was aware of it’s importance, but didn’t realize how powerful my team’s potential and worth is until the day of the show actually came. Budgets are key to any business. Make sure your budget is realistic. If it’s something you cannot commit to financially, don’t do it. Find a more practical means to lower your fixed costs as best as you can. By over-stating your budget, will cause you months of headaches later. I’m still affected by how poorly my budget was established for the April show. I will provide two budget formulas that I recently came across. Bookmark this page and refer back to it as needed. We will use 15% as an example profit margin. Even if you know you will do the numbers you need, prepare for the loss. If you prepare for a loss, you know the consequences and the costs that come if the event is not a financial success. It’s always important to know what you could loose, because if you don’t prepare, you will be in a world of hurt and even cost more later than now if you don’t. Have any questions or further suggestions on throwing your own show? Drop them in the comments below! Header image based on “FallFest Crowd” by Chad Cooper, CC-BY-2.0. Friday was our most stacked day yet! From morning to night we were running around making connects and enjoying ourselves – not to mention our sponsored Comin Outta MO showcase!